It’s heartening to know that places like Tannen’s Magic Camp exist. A summer camp held at Bryn Mawr College for aspiring magicians ages 12 to 20, Tannen’s is the subject of the slight but delightful documentary Magic Camp, which focuses on five campers over the course of the week-long session. The kids are all vastly different and yet exactly the same—whether dealing with Tourette syndrome, dropping out of high school, or being one of seven girls amid 96 boys at camp, each one needs a place to belong, and Tannen’s is a haven. 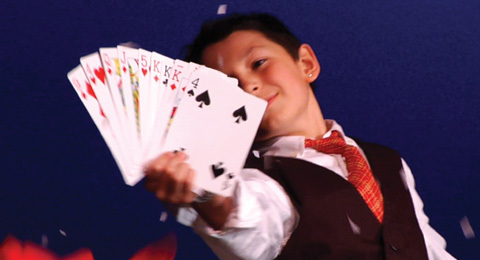 It’s gratifying to watch the budding magicians hone their skills in card tricks, close-up magic, stage presence, and more, or cheering them on in camp-wide competitions that bookend the week; it’s even more to bear witness to the supportive atmosphere the camp’s staff cultivates. Teachers take their classes seriously and give campers thoughtful instruction in private coaching sessions. Many of the campers must struggle to fit in at school, but here they welcome each other without judgment, admiring each other’s work and bonding over shared obsessions and quirks. A scene in which a counselor tries to lead a group of boys in a reluctant game of wiffle ball is priceless. Real drama, from a storytelling perspective, is scarce, but that’s as it should be. A week at Tannen’s slips by idyllically, its charges blissfully engrossed in what they love most. In this small corner of the world they are nothing but damn good magicians.